Over the past 25 years, as financial markets have become increasingly integrated, the role of foreign equities in a well-diversified portfolio has become increasingly uncertain. We present evidence that a globally diversified portfolio underperforms, on average, a U.S.-only allocation. Investors should not be overly optimistic about the potential benefits of international portfolio diversification. Over 60 years ago, modern portfolio theory was born when Markowitz  mathematically articulated the benefits of investment diversification. A related theme covered frequently in the financial press is the role of foreign assets in a well-diversified portfolio. Investment professionals commonly recommend that foreign securities compose somewhere between 20% and 40% of an individual’s portfolio (see, e.g., Geer ), and recent empirical research (Bekaert et al. ) shows that foreign assets form approximately 18% of 401(k) holdings.1 It is often acknowledged, however, that the performance of the U.S. market has frequently dominated the returns generated by foreign markets. Additionally, as economies have become increasingly integrated over time, stock market correlations have risen. Both phenomena—the dominant returns of the U.S. market and increasing correlations—potentially lessen gains from diversifying globally for U.S. investors. Partly in response, some market experts suggest that international investing is overrated (Bogle ). We compare the performance of the OTA benchmark to three real-world, ex ante, investment strategies. The first strategy stays at home and invests only in the U.S. index. Comparing the Sharpe measure of this strategy to the OTA’s measure provides an estimate of the potential gains forgone by investing only domestically. For example, over rolling 60-month holding periods beginning May 1990 and ending December 2014, the Sharpe ratio of the U.S. portfolio underperforms the OTA by 0.064, on average.4 Consequently, investing globally could, at least theoretically, improve portfolio performance by that amount. The third alternative we consider is a 100% commitment to the capitalization-weighted MSCI World Index (ACWI).7 This portfolio could be a potential default selection for high-net-worth investors (or non-U.S. investors) to guard against an overallocation to the U.S. market, if there is some concern about the likelihood the U.S. market will continue to outperform in the future. We compare the Sharpe measure of the OTA to the measures of the U.S.-only portfolio, the RWA, and the ACWI. Surprisingly, the results reveal that, on average, the internationally diversified RWA and ACWI underperform both the OTA and (typically) the U.S.-only allocation. These findings suggest that, given the performance of financial markets during the past 25 years, equity investors should not be overly optimistic regarding the benefits that will likely be attained by globally diversifying a portfolio. We must, of course, acknowledge the well-known caveat that past performance is no guarantee of future results. We do not know whether, over the next 25 years, a foreign stock market (or markets) will substantially outperform the U.S. market. For example, perhaps the European Union will emerge as an economically stronger collection of markets once Brexit discussions conclude. The record shows, however, that the U.S. stock market has performed well in comparison to many foreign markets for an extended period of time. The potential benefits of a globally diversified portfolio are well known and therefore do not require substantial elaboration. In short, with internationally diversified holdings, investors have been able (at least during some periods, historically) to boost return at a given level of risk, reduce risk while maintaining a targeted level of return, or both. These results arise because return correlations across international financial markets have historically been less than one.8 It is also known, however, that the potential gains from international portfolio diversification have diminished over time because correlations have risen with increased market integration. The data in Panel A of Exhibit 1 confirm these points. In that panel, we present the correlation between the monthly U.S. return and the monthly return of each of the four foreign stock indexes considered for inclusion in the RWA. During our overall May 1990 to December 2014 sample period, correlations range from 0.597 (Asia Pacific) to 0.801 (Europe). Breaking the entire sample period approximately into thirds, however, reveals that the correlations during the most recent January 2007 to December 2014 subperiod are all higher than those during May 1990 to December 1998, with the most substantial increase occurring between the United States and Asia Pacific (0.403 to 0.841). Panel B of the exhibit provides the annualized monthly return and standard deviation of return of each index. During our sample period, Latin America equities provided the highest returns, on average, and also exhibited the greatest volatility. The average annual return for the United States was 17 basis points below Canada’s and, compared to the other four indexes, the U.S. index exhibited the lowest standard deviation of return. Panel C presents the annualized monthly return and standard deviation of the RWA and the ACWI. Both the RWA and ACWI exhibit a lower return and higher standard deviation than the United States, confirming the strong relative performance of U.S. financial markets during the past 25 years. To obtain the upper limit benchmark estimate of the potential gains theoretically available from global diversification, the OTA selects the index weights over each 60-month period that maximize the Sharpe measure while limiting the foreign stock allocation to 40% or less of the overall portfolio. Exhibit 2 presents these weights for each of the 237 rolling 60-month periods of our sample. The first 60-month period begins May 1990 and ends April 1995; the last runs from January 2010 to December 2014. In the exhibit, the date associated with each data point represents the last month of the 60-month period. For example, for the 60-month period ending April 1995 (the first data point in the figure), the OTA has a 60% allocation to the United States and a 40% allocation to Latin America. Exhibit 2 shows that diversifying globally can at least theoretically provide improved Sharpe measure performance because, for many periods, the optimal allocation to the U.S. index is less than 100%, and that allocation frequently hits the constrained lower bound of 60%.9 The exhibit also shows, however, that the optimal allocation to each individual foreign index is highly variable. For example, for many 60-month periods, the allocation to Latin America is either 40% or 0%. Similar results exist for the allocations to Canada and Europe. Only infrequently do the optimal weights include (at least moderate) allocations to two or more indexes. Exhibit 3 reinforces this point. The exhibit presents the number of 60-month periods, out of the 237 overlapping periods of our sample, when the allocation to an index exceeds a percentage cutoff value. For example, in 142 out of 237 periods, the weight on Latin America exceeds 0.01%, and in 104 periods it exceeds 30%. In contrast, the optimal weight on Asia Pacific is greater than 5% during only two 60-month periods, and the weight never exceeds 10% in any period. The main conclusion that should be drawn from Exhibits 2 and 3, however, is that it would be impossible, ex ante, for an individual investor (or portfolio manager) to successfully predict the optimal allocation to each index for any upcoming 60-month period because there is too much variability in each index’s allocation over time. Nonetheless, the OTA is useful because it demonstrates that diversifying globally is at least theoretically beneficial, and the OTA sets an upper limit benchmark on potentially attainable performance. That benchmark can be compared to the actual performance of our three, more typical, portfolio allocations. A related issue is the difference, during each 60-month period, between the Sharpe measure of the portfolios and the measure for the OTA. Panel B presents this information. As shown in the panel, the U.S. portfolio comes closest during each 60-month period, on average, to the performance of the OTA. For the United States, the average underperformance is −0.064, whereas for the RWA it is −0.072 and for the ACWI it is −0.099. Similarly, the corresponding median differences are −0.033, −0.069, and −0.089. These findings for the RWA and ACWI further support the view that the benefits of global diversification may be overrated. Our sample period contains several financial crises, and these enable an exploration of the performance of the three portfolios relative to the OTA during periods of relative financial tranquility and periods of turmoil. Exhibit 5 displays this information for each of the 237 60-month periods and shows that the difference between the U.S. Sharpe measure and OTA measure is often close or equal to 0.000.12 This result is expected when the returns of the U.S. portfolio dominate returns available in foreign markets. There are, however, 60-month periods in which the U.S. index underperforms substantially relative to the OTA. For example, Exhibit 5 shows that, during the period beginning September 1998 (with a 60-month ending date of August 2003) and ending October 2011, the U.S.-only portfolio is the weakest performer.13 That time window contains two U.S.-led financial crises, the first, the collapse of the NASDAQ Internet bubble, occurring during 2000. The second, the mortgage-backed securities–related meltdown, began in 2008. Periods of financial turmoil are exactly when the potential benefits of global diversification should be most useful. Although the exhibit shows that the U.S. portfolio underperforms the OTA during those times, it shows similar, but less extreme, underperformance by the RWA and the ACWI. Recent empirical research (Bartram and Bodnar ) has reported that financial markets often become more highly correlated during times of financial turmoil.14 This increased correlation undermines the potential benefits of diversification. To explore whether correlations increased during the times when the U.S.-only portfolio exhibited its worst performance (the 60-month periods with ending dates between August 2003 and October 2011), we examine return correlations during three subperiods. The first, which we label the Pre–Financial Crises subperiod, ranges from May 1990 to August 1998. We stop at August 1998 because the next month starts the first 60-month period in which Exhibit 3 shows the U.S.-only portfolio began underperforming relative to the RWA. The second, referred to as Financial Crises, ranges from September 1998 to October 2011. The third, labeled Post–Financial Crises, runs from November 2011 to December 2014; this is the time period in which the U.S.-only portfolio again outperforms the RWA. The results are presented in Exhibit 6, and they show that correlations are highest during the Financial Crises subperiod. More specifically, during that time, the lowest correlation of monthly returns rises to (a not so low) 0.741 between the United States and Latin America, and the highest correlation hit 0.856 between the United States and Europe. In the third subperiod, each correlation declines—although not to the levels seen pre-September 1998. These results allow some insight into why the U.S.-only portfolio exhibits a higher average Sharpe measure than both the RWA and the ACWI (and comes closest to the measure of the OTA benchmark) over our entire sample period. Certainly, correlations have been increasing generally over time. More importantly, however, correlations increase during periods of financial turmoil, and those increased correlations lessen the potential benefits derived from global diversification—just when those benefits are needed most. In other words, during the Financial Crises subperiod, both the RWA and ACWI outperform the U.S.-only portfolio, but that outperformance is not enough (due to the increased correlations) to offset the better performance, on average, of the U.S.-only portfolio during the other subperiods of our 25-year sample. Consequently, the data do not, overall, make a convincing case for diversifying globally. Examining the mean and median Sharpe measures for each of the four portfolios during the subperiods provides additional support for this conclusion. For example, Panel B of Exhibit 7 shows that during the Financial Crises subperiod, as stocks in the United States performed poorly (mean Sharpe measure of 0.029), so did many of the stocks in the foreign market indexes—leading to a relatively low Sharpe measure for the RWA (mean = 0.084), ACWI (mean = 0.087), and OTA (mean = 0.164). WHAT ABOUT THE FOREIGN SMALL-CAP SECTOR? The foreign stock indexes used in the preceding comprise large-cap and mid-cap equities. The returns of larger companies, however, may be driven by a common set of global (rather than country-specific or idiosyncratic) factors, which could undermine the diversification potential of those firms. Instead, better diversification opportunities may come from investing in small-cap foreign equities.15 Relatedly, recent research (Eun, Huang, and Lai ) has reported that small-cap foreign funds exhibit low return correlations with the U.S. market. Consequently, it is worth exploring whether the case for international diversification is strengthened if we restrict our foreign indexes to just small-cap stocks. MSCI small-cap return data are first available for all four of our foreign indexes beginning January 2001, and in Exhibit 8, we present their return correlations with the U.S. index. The correlations for the small-cap indexes are generally a bit lower than the correlations of their larger-cap counterparts. However, the differences are not substantial, and the correlations are all higher during the Financial Crises period. Consequently, the initial indication is that investing in the foreign small-cap sector may not substantially improve diversification gains. Next, we use the portfolio weights of the RWA to construct RWA (small-cap) and calculate the Sharpe measure for this portfolio during the 109 overlapping 60-month periods beginning January 2001. During those 109 periods, the Sharpe measure of the RWA (small-cap) minus the measure of the OTA is, on average, slightly better than the corresponding difference for the RWA. For example, the RWA (small-cap) underperforms OTA, on average, by −0.070, whereas over the same 60-month periods the underperformance for the RWA is −0.072 (an improvement of 0.002). Similarly, the median difference over the 109 periods is −0.058 for the RWA (small-cap) versus −0.069 for the RWA (an improvement of 0.011). Although we do not have small-cap index data for our full 1990–2014 sample period, if we assume that the small-cap indexes would provide similar enhancements to performance over the entire 25-year window, the improvement is not sufficiently large to override our assessment that investors should not be overly optimistic regarding the potential benefits of global diversification. As noted previously, Panel B of Exhibit 4 shows that, during the entire sample, the U.S.-only portfolio underperforms the OTA by −0.064, on average, whereas for the RWA the comparable difference is −0.072. Improving the RWA’s Sharpe measure performance by 0.002—the average amount of improvement shown by the RWA (small-cap)—is not substantial. A similar conclusion holds for the potential improvement in median results. Where does this leave the role of foreign stocks in a well-diversified portfolio? The evidence presented in this article shows that, at least theoretically, diversifying globally can enhance investment performance. To obtain those theoretically available benefits, however, investors would need to frequently adjust the mix of foreign assets in their portfolio, and recent empirical work (Barber et al. ) shows that individual investors are not (in general) good at market timing. Consequently, it is highly unlikely that they (or, for that matter, any investment professional) would be able to identify, ex ante, the frequently changing proportional weight of each asset in the OTA. Most importantly, we present evidence that over the past 25 years, a U.S.-only equity portfolio outperforms, on average, both a portfolio with a commonly recommended percentage allocation to foreign stocks and the MSCI World Index. Taking these results collectively, the main conclusion from our analysis is that U.S. investors should not be overly optimistic regarding the benefits likely to be gained from international portfolio diversification. I would like to thank Mike Ferri, J.D. Opdyke, George Wang, and an anonymous referee for helpful comments and suggestions. ↵ 1An average 401(k) allocation of only 18% to foreign stocks is low compared to the relative percentage weight of foreign equity markets in the overall equity market capitalization of the world. However, Cooper and Kaplanis  found that investors exhibit a home bias and tend to concentrate their equity holdings in their domestic market. Interestingly, home bias is not just a U.S. phenomenon—it occurs throughout the world. For example, Cooper and Kaplanis  reported that Spain’s equity market capitalization is less than 2% of the world total, yet Spanish investors allocated over 94% of their investment funds to Spanish equities. Possible explanations for home bias include avoidance of currency risk, foreign taxes, higher transaction fees, and increased monitoring costs (associated with foreign equities). ↵ 2The Sharpe ratio is defined as the average return of a portfolio minus the risk-free rate, divided by the standard deviation of return. In our analysis, all monthly index returns are measured in U.S. dollars and are obtained from MSCI. In addition, our analysis includes no short selling. ↵ 3The MSCI AC Europe includes stock market returns from Austria, Belgium, Denmark, Finland, France, Germany, Ireland, Italy, the Netherlands, Norway, Portugal, Spain, Sweden, Switzerland, the United Kingdom, the Czech Republic, Greece, Hungary, Poland, Russia, and Turkey. AC Asia Pacific includes returns from Australia, Hong Kong, Japan, New Zealand, Singapore, China, India, Indonesia, Korea, Malaysia, the Philippines, Taiwan, and Thailand. Lastly, EM Latin America includes returns from Brazil, Chile, Colombia, Mexico, and Peru. In addition, our analysis does not consider the use, ex ante, of rolling forward (or futures) contracts to hedge anticipated foreign stock returns. Instead, as noted, all monthly returns are measured in U.S. dollars and therefore include the impacts of both the foreign stock index return and the foreign currency return. Relatedly, we note that Vanguard’s Total International Stock Index Fund reports, as of October 31, 2015, total assets of $186.571 billion but futures contracts of only $47 million and forward contracts of only −$5 million. Consequently, Vanguard’s net use of currency hedges, in that fund, is quite insignificant. ↵ 4During each 60-month period, we calculate the Sharpe measure for each index by taking the mean of the monthly excess return divided by the standard deviation of excess return. Consequently, all the Sharpe measure values are expressed in monthly terms. Each value can be annualized (per the approach used by Morningstar) by multiplying by the square root of 12. Excess returns are calculated by taking the difference between the monthly index return and the contemporaneous 30-day Treasury bill return (the Treasury bill returns are obtained from the Center for Research on Security Prices). ↵ 5Relatedly, Barber et al. report that individual investors are ineffective market timers. ↵ 6The stock market capitalization data are obtained from the World Federation of Exchanges. Selecting portfolio allocations based on relative market capitalizations is a reasonable diversification approach: It is a passive investment allocation methodology that does not require market timing. ↵ 7The MSCI ACWI is a capitalization-based global market index based on the returns of large- and mid-cap stocks in 23 developed markets and 23 emerging markets. ↵ 8For evidence regarding the potential benefits of international portfolio diversification, see Solnik , Eun and Resnick , and Errunza and Losq . ↵ 9Note that whenever the optimal allocation to the U.S. index equals 100%, the Sharpe measure for that 60-month period is optimized by investing only domestically. ↵ 10The Sharpe measure of the OTA will not necessarily exceed the measure for the ACWI because, unlike the RWA, the ACWI is not restricted to a foreign equity allocation of 40% or less. ↵ 11An associated question is whether the Sharpe measure of the U.S. portfolio is significantly different from (greater than) the measures for the two globally diversified portfolios. We test the differences using the approach developed by Opdyke . For this analysis, a single Sharpe measure for each index (U.S., RWA, and ACWI) is calculated using the monthly data over the entire 25-year sample period. (The resulting Sharpe measures are as follows: U.S. = 0.154, RWA = 0.134, and ACWI = 0.107). Testing whether the Sharpe measure of the United States is significantly greater than the RWA measure results in a (one-tailed test) p-value of 0.213; for the United States versus the ACWI, the (one-tailed test) p-value is 0.122. ↵ 12Similar to the format of Exhibit 2, the date associated with each data point represents the last month of a 60-month period. Note that the difference equals zero when the U.S. weight in the OTA equals 100%. ↵ 13During 99 of the 237 (42%) overlapping 60-month periods, the Sharpe measure for the U.S.-only portfolio is lower than the measure for the RWA. ↵ 14Similar results for earlier time periods have been reported by Longin and Solnik . In addition, Longin and Solnik  reported that increased correlations occur during volatile bear (but not bull) markets. ↵ 15For a discussion of these points, see Eun and Resnick [2012, p. 392]. ↵ 16The analysis in this article focuses on the potential benefits of international portfolio diversification for U.S. investors. The potential gains for investors in other countries, with a non-U.S. dollar home currency, may be different. For example, Exhibit 1 shows that the Asia Pacific Index provided the lowest return and second-highest standard deviation—when compared to the other indexes—during our sample period. Investors in that region could have benefited from diversifying globally. “Just How Much Do Individual Investors Lose by Trading?” Review of Financial Studies , Vol. 22, No. 2 (2009), pp. 609-632. “No Place to Hide: The Global Crisis in Equity Markets in 2008/09.” Journal of International Money and Finance , Vol. 28, No. 8 (2009), pp. 1246-1292. “Who Is Internationally Diversified? Evidence from 296 401(k) Plans.” Working paper no. w21236, NBER, 2014. “I Wouldn’t Risk Investing Outside the U.S.” Bloomberg Business , December 9, 2014. “Home Bias in Equity Portfolios, Inflation Hedging, and International Capital Market Equilibrium.” Review of Financial Studies , Vol. 7, No. 1 (1994), pp. 45-60. “How Risky Are Emerging Markets.” The Journal of Portfolio Management , Vol. 14, No. 1 (1987), pp. 62-67. “International Diversification with Large- and Small-Cap Stocks.” Journal of Financial and Quantitative Analysis , Vol. 43, No. 2 (2008), pp. 489-524. 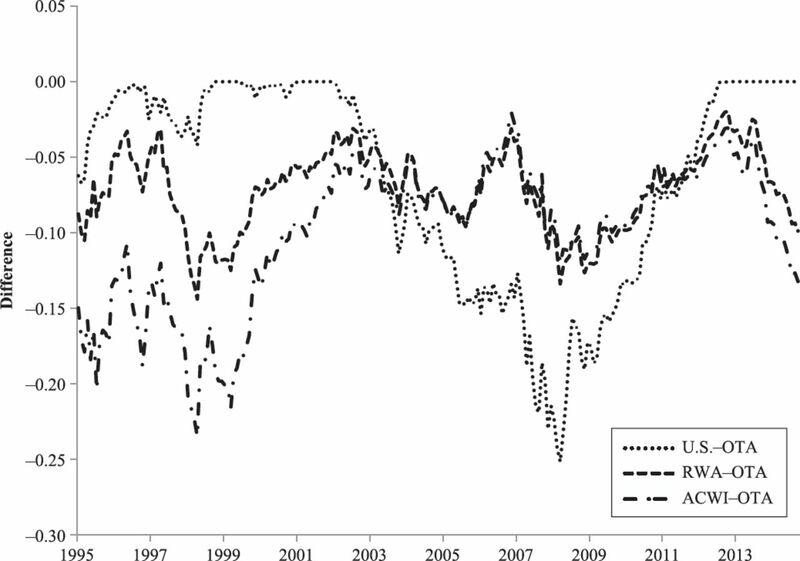 “Estimating the Correlation Structure of International Share Prices.” The Journal of Finance , Vol. 39, No. 5 (1984), pp. 1311-1324.
International Financial Management , 6th ed. New York: McGraw Hill/Irwin, 2012. “Diversify Your Portfolio With International Stocks. Put 20% to 40% of Your Portfolio in Non-U.S. Shares.” The Wall Street Journal , August 17, 2013. “Is the Correlation in International Equity Returns Constant: 1960-1990?” Journal of International Money and Finance , Vol. 14, No. 1 (1995), pp. 3-26. “Extreme Correlation of International Equity Markets.” The Journal of Finance , Vol. 56, No. 2 (2001), pp. 649-676. “Portfolio Selection.” The Journal of Finance , Vol. 7, No. 1 (1952), pp. 77-91. “Comparing Sharpe Ratios: So Where Are the p-Values?” Journal of Asset Management , Vol. 8, No. 5 (2007), pp. 308-336. “Mutual Fund Performance.” Journal of Business , Vol. 39, No. 1 (1966), pp. 119-138. “Why Not Diversify Internationally?” Financial Analysts Journal , Vol. 30, No. 4 (1974), pp. 48-54.